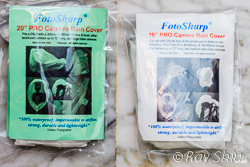 The FotoSharp rain covers are covers made of plastic (like a shower cap) and has a powdery feel to it. The material is called Silnylon and it's light, thin and durable. Way more durable than the disposable type covers. These covers are available in different sizes and colors. Thes covers are basically a sleeve with one opening larger than the other and have bungy cord and clasp so you can cinch them up tight to your gear. The pro version has a velcro opening that spans the length of the sleeve stopping just short of the bungy cords. This opening facilitates the use of a tripod and also for your hand should you need to reach your hand in there to fiddle with your lens. What's included? A small pictorial instruction sheet with additional info and a wide rubber band (or two). I'm guessing they are used to further secure the rain cover or help strap down excess or can be used to help stop the cover from slipping "down" off the lens hood if you choose to tighten the bungy cord around the hood. FotoSharp's white, pro version can be used with a flash depending of course on the size of the cover you order and the gear you're using. A video, if you're interested in having a look, is HERE. 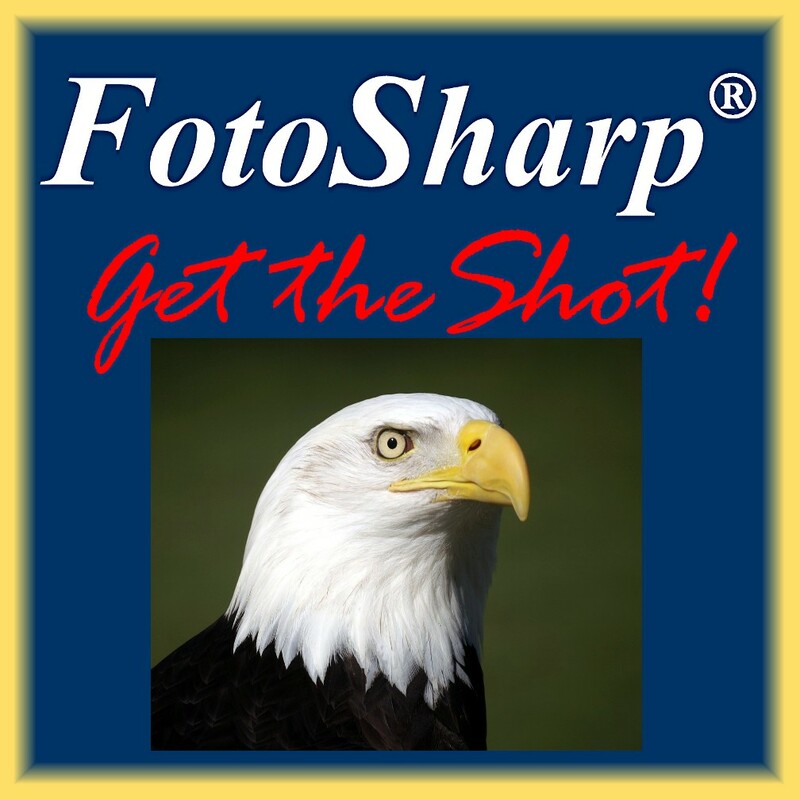 If you want to see someone walking around in the rain with the FotoSharp rain cover on their camera, click HERE. Anyone who shoots outdoors will at one point or another need this or something similar. Pro gear may be able to hand a drizzle now and then but it is nerve wracking at the time. 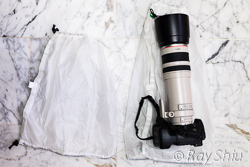 Nature photogs would definately need a few of these in their bag. If you're out and about and it suddenly starts to pour (like in the tropics), what are you going to do? Open up your bag to put your camera in, thereby exposing the rest of your gear? Or just reach into a pockt grab one of these sleeves and slide your camera in. One swift motion and voila! protected, just cinch up while cradling your gear and you can keep on shooting if you'd like. These rain covers are relatively inexpensive but high quality and easy to put on. It's thin enough that you can work the dials, rotate the focus / zoom rings, operate the shutter button etc. but won't tear on a minor snag on a twig. On the clear version, you can fire a flash through it, if more light is required. Different sizes and color options ensures there is something to fit your gear combination. The ease of deployment is also something to consider. Especially when walking around (like a tourist) in a tropical country where it could be sunny then pouring 5 minutes later. It's so quick and easy to just pull out the rain cover and slide the camera, lens first into the sleeve. I found it quite cumbersome to shoot hand held in the rain with the back end open so I bought an eyepiece extender and cinched the cover around it. You can see how (Photo: left). That eye piece extender is the one from Think Tank Photo for the Canon 7D (Canon doesn't make one at the time of this writing). For the Canon 5D Mark II I use the Canon EP-EX 15. I have opted to cinch the rain cover over most of the hood because some lenses have grooves really close to the end of the lens (like the Canon EF-S 10-22). For petal shaped hoods you can slip the rain cover over both short petals (Photo: right, bottom) and it won't be seen in the view finder (tried on Canon 24-105 and 70-200) however on the EF-S 10-22 at 10 mm you see a bit that you can maneuver out of the shot but tugging a bit on the rain cover. 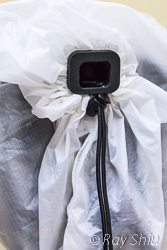 On barrel hoods, the included rubber bands are great, I put that on the hood then cinch the rain cover above the rubber band to help stop the cover from sliding and dragging water onto the lens. I'm going to put gaffer tape on the hood to help give the rubberband more grip. You may want to consider this if you use the EF-S 10-22 as the hood and some grooves of the lens are pretty close, so much so if you cinch the rain cover between the lens and the hood you'd cover the zoom ring groove and any slippage of the cover will drag water in. There are more photos in my Flickr set HERE. A couple of videos on our Youtube channel HERE. Note: for the Canon extender, you will lose 30% view in the viewfinder meaning things get magnified in the viewfinder. To bypass this, unscrew the 2 screws and take out the two plastic lenses (and the metal mounting plate if want) and re-assemble to two black pieces. View is now almost exactly the same as with no extender. For me it is and I wear glasses. For the Think Tank Photo Extender it'll work perfect straight out of the packaging. 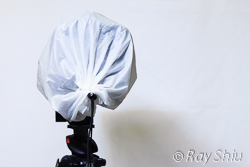 The FotoSharp rain covers can be crumpled up to around the size of a ball of paper (it'll spring open once you let go) so the easiest way is to fold it up. 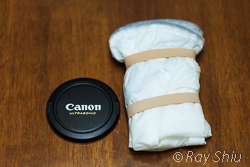 The photo on the left is a 77mm lens cap and the 20" pro cover as it came out of the package. 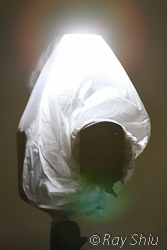 These rain covers can faciliate a flash inside and the material acts as a diffuser. Bonus! You can still remote trigger the camera through the material as well as the wireless flash, although it'll be really hard fit any flash triggers in with the camera. It's waterproof! Having shot in the rain before, I've had to send in lenses for repair right after. So I firmly believe that any non weather sealed lenses wouldbe safe in one of these. I'm pretty sure it'll be sand proof too. I know I won't so squeemish and protective while at the beach and water parks with my kids or even playing in the snow. There are two cloth tabs that you pull on that makes separating the velcro very easy. The velcro is only available on the pro models to facilitate a tripod or your hand to operate the zoom / focus ring(s). There isn't really anything to hate about this cover. If you want to nitpick then maybe you'd find that it's a bit cumbersome when shooting hand held in the rain because you can't get your face into the sleeve to look through the view finder and you can't really use the liveview because the cover gets bogged down by rain. You can't really see through the cover to check your composition on the screen unless you hold the cover directly on the screen. This is an easy solve tho. Scroll up to "How I use this" to check out what I did. On tripods, you could easily hold up the flap and get your face in the sleeve to use the viewfinder if you don't have live view (or don't want to use live view). If you have a hard time finding the shutter button from outside the cover, stick a C-SLR pro dot on the shutter button. It helps A LOT! There's some photos in my photostream of the prodot HERE. You can get them on Amazon via this link: Custom SLR ProDot Shutter Button Upgrade, 2 Pack, Red (it comes in black and clear as well). Being able to completely cinch up the back means you can leave the camera outside for time lapses, or long exposures without having to worry about water, sand, dust etc. I think everyone with a dslr needs at least one of these in their camera bag if they ever shoot outdoors. Even studio photographers who are into macro splash photography or parent at a water park. The cost of one easily cheaper than a repair bill. 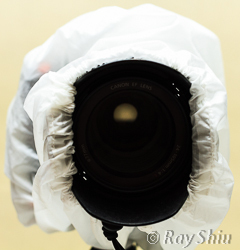 The FotoSharp rain cover is more durable than any of the cheaper rain covers I've seen/tested to date. The size is negligable, it'll fit or can be squeezed to fit into almost anything. I have 2 pro, white covers and will be getting more. For sure one smaller than the two I have now as I find them both too big for a camera + efs 10-22 and no flash combination. I may order a set of three camouflage ones too. 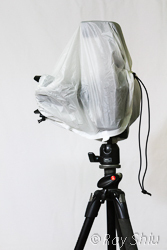 Unless you are a pro photographer who needs to sit in a press area or on the sidelines the whole game in the rain, the FotoSharp rain cover will meet your needs. Do consider getting eyepiece extenders to use with these covers, the piece of mind of not having to fumble around in the rain is worth the few extra bucks for the extender. If you're getting the Canon one (EP-EX 15 or 15 II, you can take out the plastic lenses inside so you don't lose 30% of the viewfinder). © 2010 - 2015 Newbiephoto.net.All rights reserved.